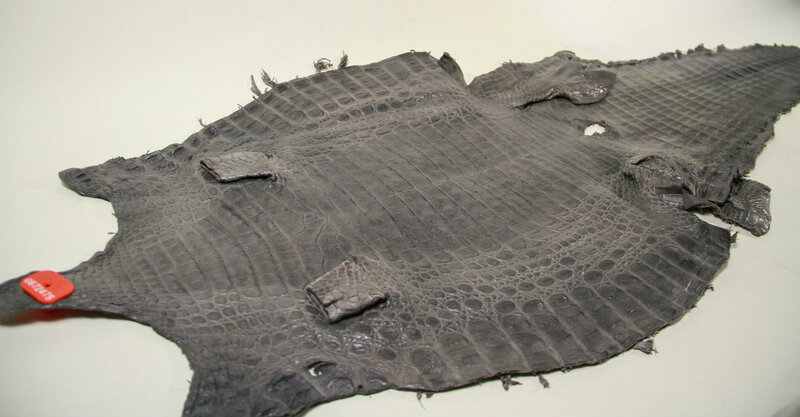 We import and wholesale genuine caiman skins from South America. The species we stock and offer is Caiman crocodilus fuscus, and is legally sourced from Colombia. Caiman are a great alternative for those on a fixed budget when compared to more commonly known alligator and crocodile skins with a similar reptilian appearance. 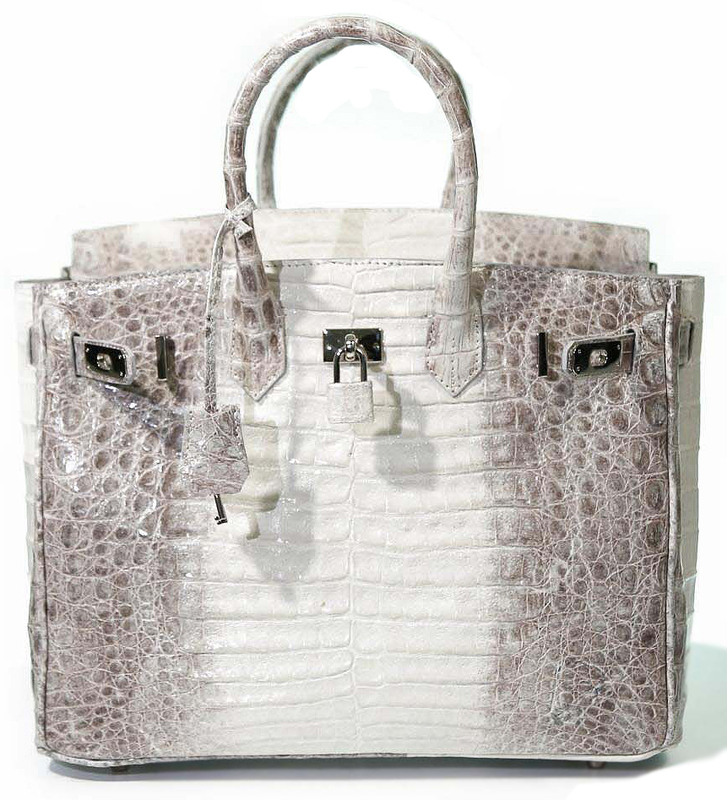 It is one of the most popular luxury leathers for shoes, belts, handbags, wallets, and luggage as caiman skins are 200 -500 percent less expensive than similar size alligator or crocodile skins. We offer both a belly cut and a Hornback cut in matte, glazed, and suede finishes. We use the metric system to calculate the costs, in two classifications. Our currently stocked caiman belly and Hornback skins range from 35-39cm, and 40cm up. The only time caiman cannot be used as a substitute is when pattern sizes exceed 46cm or 18″ at the widest section. Caiman Horn Back collection, perfect for shoe, saddles or handbag manufacturing. Caiman skins are generally regarded as entry level crocodilian skin or leather because the species is prone to spotting or pits in the skin’s tiles which do not properly accept dyes in the tanning process. First-grade skins from a quality tannery can yield these imperfections nearly negligible, but 2nd or 3rd grade skins commonly demonstrate this pitting effect. Typically, the larger the skin the greater the chance for spots or pits. Whether or not a caiman hide will work for your application depends on many factors including time, availability, budget, color, finish, and size. 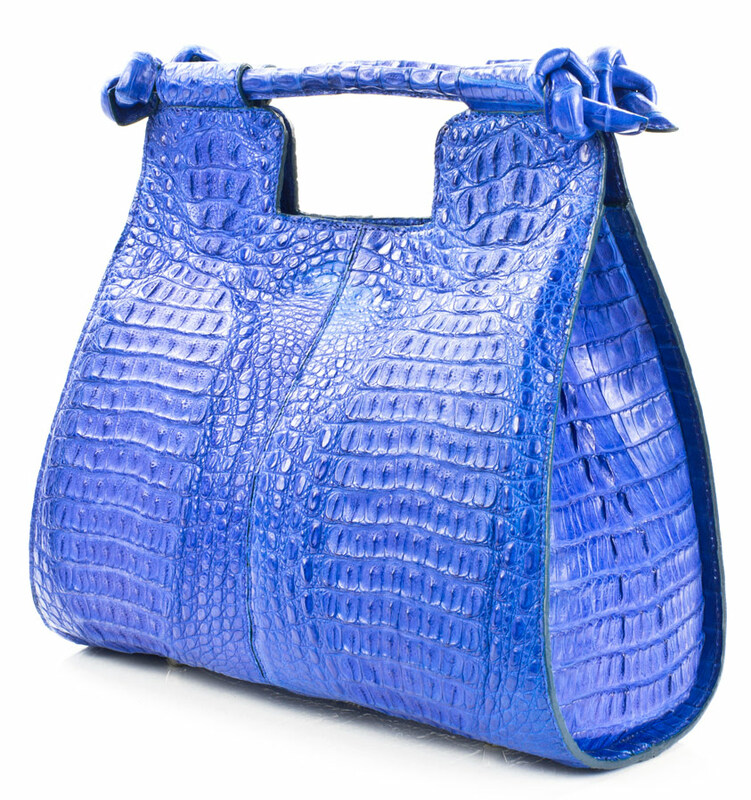 Many famous designers now use caiman in their production and have since popularized this species with innovations in tanning and international marketing. 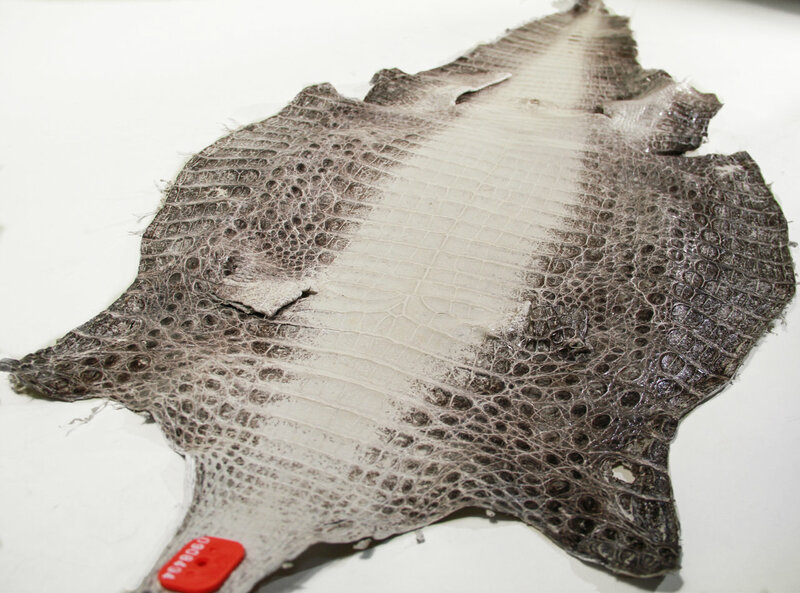 While we offer largest collection of currently stocked caiman skins in a revolving stock from several tanneries, everyone’s needs differ to a degree. If you have a specific color in mind and have a deadline that is quickly approaching and do not see exactly what you need than considering giving us a production order. 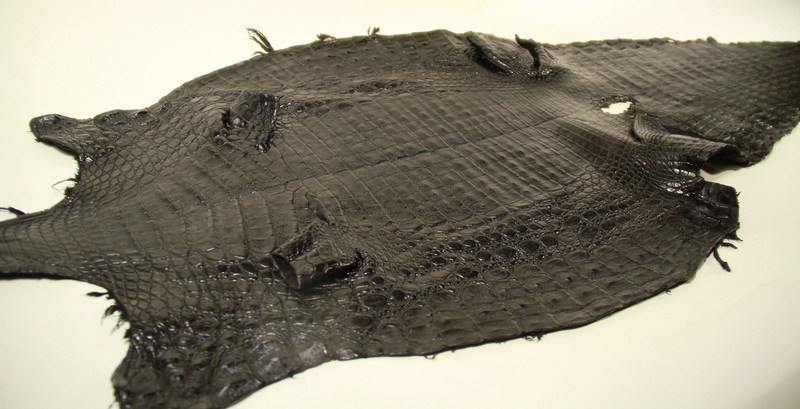 We have a US based tannery with thousands of caiman skins in crust in various sizes. We need only 10 working days and 8 skins per color delivered in less than 2 weeks. Did you know it takes a minimum of 45 days for a production order to arrive when ordering from overseas? We match your color swatches at a minimum of 90% and you will receive your production order in less than 2 weeks guaranteed. If you have time upwards 60 days we can offer you better prices and more finishing options as our local tannery can only produce matte finish skins, however, the minimum order is 20 skins per color and finish for imported skins. Caiman skins (crocodylus fuscus) are often labelled as being “crocodile skin“. 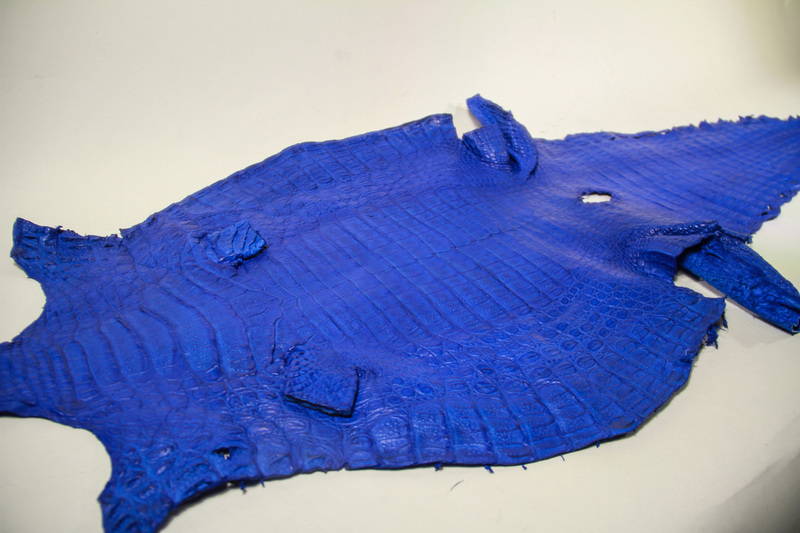 The two are distinctly different; while is pliable and smooth, caiman skins are more brittle because of bony plates (known as ossifications) underneath the scales. While caiman’s value in the leather trade cannot be underestimated, it is important to know this distinction and the historical background to understand the difference in value between the two and to avoid being deceived into purchasing skins that are far less valuable: in the 1930’s and 1940’s, caiman was a popular choice for briefcases, handbags, and small leather goods. From the late 1940’s leading through the 1960’s, caiman skin imports from South America started showing up in the United States and sold as “crocodile”, where they were actually caiman. It is the purchaser who is deceived when this happens; it is important for both a manufacturer and the end user to know the difference between crocodile and caiman. Caimans live throughout Central and northern South America where populations amass in the swampy coastal regions. Caiman are a saltwater dwelling reptile, but can survive in a water of widely varying salinity. They grow to an average of 1 meter in length and are almost always brown to olive-brown in color. The bulk of their diet consists of snails, crustaceans, and small fish. These reptiles are not generally active hunters and will eat anything opportunity affords them. The effort to reintroduce captive-bred caiman into the wild is a fledgling effort in only a handful of the developing countries in the Central/South American region. Caiman are a fully protected in several countries (Ecuador, Mexico, Venezuela), with hunting restrictions in force in others (Colombia, Panama). However, protection is rarely enforced effectively. To ensure the biodiversity and health of caiman as our precious resource, we at Rojé (pronounced “row-shay”) procure our raw skins from certified farmers and harvesters adhering to strictly manged quota systems and follow all international CITES and local US Fish and Wildlife laws and regulations.